NASA's mission to orbit the icy Jovian moon Europa recently entered a new phase of mission planning that is focused on creating preliminary designs for the instruments and spacecraft. A NASA mission that will send a probe to Jupiter's icy moon Europa recently passed a critical stage on its long journey to the Jovian system. Europa is one of a handful of locations in the solar system that scientists think could host an environment fit for life. Beneath an ice layer about 10 to 15 miles (15-25 kilometers) thick, the moon is thought to harbor a liquid water ocean, possibly warmed by geologic processes originating in the planet's core. With heat, water and nutrients, subsurface Europa could resemble the deep-sea ocean vents on Earth that support vast ecosystems. 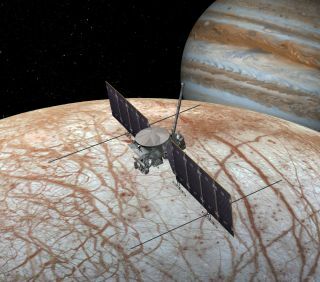 The $2 billion Europa mission will orbit Jupiter's icy moon, using its instruments to observe the surface up close and probe for information about the subsurface environment. Its primary objective is to determine if Europa hosts an environment that can support life. The spacecraft will not land on the surface of the moon, and may not be equipped to identify the presence of life there. NASA said it is considering a future Europa lander mission. Still in the planning stages, the mission recently moved along the NASA mission pipeline from Phase A into Phase B. During Phase A, the Europa team selected 10 instruments (initially 9) that will fly on the spacecraft and collect data about the tiny, frigid world. Those instruments include high resolution cameras to map the surface, and head detectors to look for temperature variations and possible locations where plumes of liquid are erupting from cracks in Europa's surface. Another instrument on the spacecraft may be able to collect and analyze those plumes. A magnetometer and a magnetic sounder, along with ice-penetrating radar, will measure the thickness of the ice and the subsurface ocean. To pass into Phase B, the team had to create general design concepts for the instruments, and show that those instruments could fit within the limits of the spacecraft, including its maximum weight, power supply and size. The focus of Phase B will be to further refine the mission objectives, and eventually make preliminary design plans for the spacecraft, Joan Salute, the Europa mission program executive, told Space.com in an email. That essentially means creating a complete blueprint for the mission hardware, including the instruments, down to the smallest subsystems. Some pieces of the instruments and the spacecraft will need to be constructed or manufactured during this phase to make sure they work and can fit the necessary parameters, but the complete construction of the mission hardware won't take place until Phase C.
There are specific challenges that the Europa mission instruments and spacecraft have to overcome, Salute said. For example, the probe will fly through a harsh radiation environment that could fry a particular instrument if it isn't sufficiently protected. The spacecraft must also be sterilized to meet NASA's planetary protection requirements: In the event that Europa is home to some kind of life, a microscopic organism piggybacking on the Europa spacecraft could potentially make its home on Europa and alter the alien ecosystem (as has happened with invasive species that are transplanted to new environments on Earth). So, the Europa spacecraft and all its instruments will have to be built from materials that can be thoroughly sterilized. And, as the details of the instruments emerge, they still have to meet the weight, power and size limitations of the spacecraft. For the Europa team, planetary scientists and researchers interested in the search for life in the solar system, each step of the Europa mission's journey is an important one. "[Entering Phase B] literally means the mission is proceeding towards launch, increasing the likelihood that these scientists will eventually receive [data from the spacecraft]," Salute said. "If the mission had not passed the Independent Review, or the Agency needed to slow the project down for other reasons, they would not have been allowed to enter Phase B."